The third in my (very slow) series of being a disciple as a parent (see the first and second posts) deals with ‘meeting together’. So…what is ‘meeting together’? Church once a week? Well, yes, partly. It’s good for us and our kids to grow up within a church family, getting into that pattern of meeting together regularly as a bunch of believers. And actually the kids’ groups in most churches model a really good form of meeting together. Even Mister, at just 3, is in a small group where there is opportunity to chat stuff through. that doesn’t usually happen at ‘grown-up’ church! So, much as church is important, of immense value is the small accountability group model: somewhere safe, with good relationships, where you can be honest with others. This could mean simply finding another Christian to pray with on a regular basis, and some of my friends do this. What a great way to grow your faith as a young parent! One of the downsides to online ‘meeting together’, e.g. Facebook or Twitter, is that you tend to see only people’s highlights. Before long, you start to believe that everyone else frequents luxury spas on a weekly basis, has genius children who look great in every photo, and an incredibly romantic husband who brings home thoughtful gifts each night of the week. When you are in real relationship with others, you see everything: the highlights, the lowlights, the in-between-lights. I believe this is one of the reasons why we need to take seriously those verses in Hebrews. We’re not usually this serious…I asked them to put their heads down just in case they didn’t like this blog post and wanted anonymity! I am incredibly fortunate to belong to a daytime cell group for mums. Every Monday afternoon, a group of mums gather together in our study for an hour to worship, read the Bible, chat about it, and pray together. For someone who rarely goes to the toilet without interruption from a Small Person, this is a Big Thing. Our children, meanwhile, are being superbly entertained in the lounge by some wonderful creche volunteers. Honestly, these guys are unsung heroes. I try to tell them how much their work is appreciated, but I don’t think they believe me. While they’re building towers, bopping to nursery rhymes, sorting out snacks, reasoning with toddlers, rocking babies and being jumped on (often simultaneously), lives are being changed in the next room. Maybe. Sure, it’s a gradual thing, but when I look back over the last 12 months and see where God has taken me, I know I owe a huge amount to this group. My faith could easily have become stagnant during this phase of early motherhood. Instead, the input of others, their challenge, their making me think – God is using these things to draw me, and many others, closer to Him. And it’s something as simple as playing Duplo with my kids for an hour that enables this life-change – this growing of my mustard-seed faith – to happen. It’s not just knowing God is there somewhere in the background, it’s seeing Him do amazing things during these otherwise desert years. Exciting! 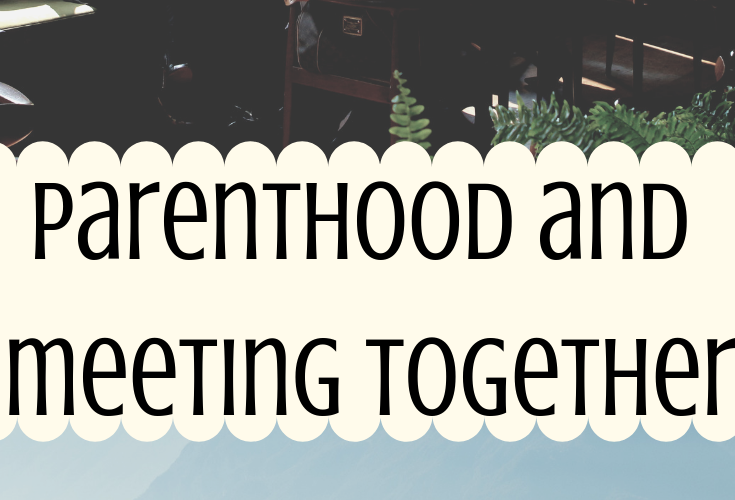 If you’re a young parent, how do you continue ‘meeting together’ with other Christians? If you can’t think of anything – have you ever thought about starting something? Meeting up with a Christian friend regularly? Or even getting together the parents in your church to start something? Thanks for the latest Desertmum blog. Enjoyed it and loved the pictures – especially the lounge! But the sense of peace for very busy Mum’s is another thing worth celebrating, as the benefits of that time together will spill over into the lives of the children and husbands/parners too. But perhaps the best celebration is the evidence of children having enjoyed their time playing together; enjoying each others company learning to form friendships and trusting others to look after them. It would have been good to see a picture of the carers – probably looking quite worn and ready for a break!? But they are also a cause for celebration as they enjoyed the attention of adoring children and lots of fun and laughs as a reward for serving others; ‘Well done those faithful servants! Becoming weary looking after, or playing with, children is one of life’s great joys and always worth celebrating. Keep celebrating what God is doing among a group of desertmums and their children. Thanks for another great blog.